My intention was to display some measurement data of my home which I collect with Netatmo or WirelessTag . Furthermore, I had the idea to supersede the paper wall calendar with a digital calendar. We use already Google calendar but my wife has the opinion that she need a calendar not only accessible with a computer or a mobile phone, there must be also something on the wall to get faster an overview about the upcoming events. So I told my wife that I plan to install a monitor screen in our entrance area, honestly the enthusiasm was very limited. I found out that the WAF – the wife acceptance factor for a monitor screen in the apartment is pretty low. 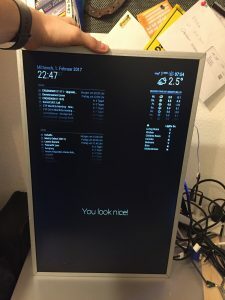 So I needed another idea, accidentally I saw the MagicMirror² Project which is the solution for my Software Plattform and also the word “Mirror” solves the WAF-Problem. So there is now no more a monitor screen, instead my project is a Mirror, a Smart Mirror to be precise. 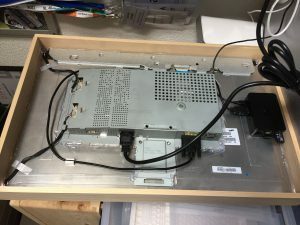 Behind the Mirror is a Raspberry Pi 2 located which is powered on 24/7, rather the power of the screen itself is controlled by a MyStrom Wifi Switch in early morning a motion dedector turn the mirror on, at other hours in the day the screen can be activated with a push on a MyStrom Wifi Button. If the Mirror is powerless it looks like an ordinary mirror. It was a long journey and I invested a lot of hours until I was happy with the result of my project. First I started to cover the screen with an acrylic glass laminated with a mirror foil. I was not satisfied with the result, I had inclusions of dust and air under the foil. Only the more expensive but high-grade real Spy-Glass from myspiegel.de made me happy. It was also difficult to decide which content should appear on the display. Smart (IoT) Button (optional) – e.g. I have this one MyStrom Wifi Button. The mirror definitely gives an added value, but it’s really only for DYO’er or Nerds … No Enduser-Friendly product. It also needs maintenance. This is a device for consume information but you cannot interact with your devices. Maybe in Some years possible with a “Touchscreen-Mirror”. hi, this is very useful information for the smart home who construction newly. thank you, sir. 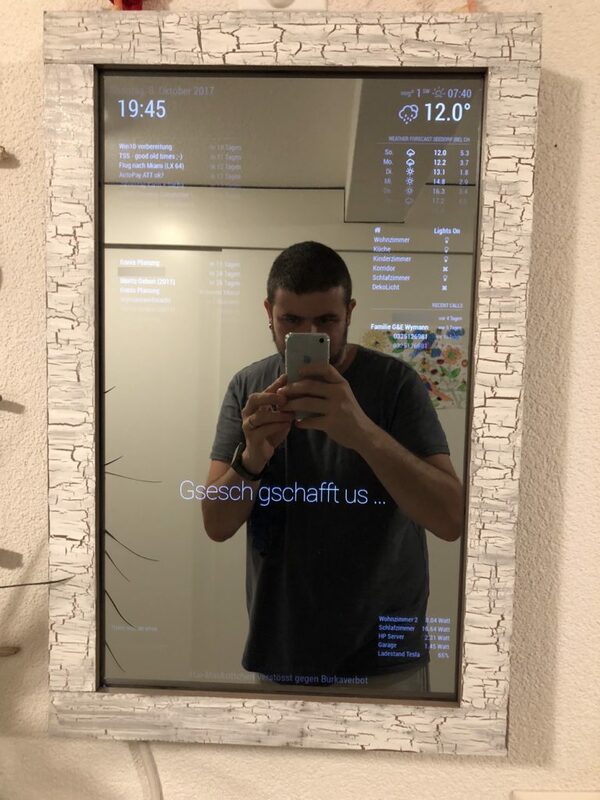 Ich möchte für eine Präsentation das Smartmirror-Prinzip nuten und anstatt Nachrichten, Wetter etc. ein Video abspielen lassen. Nun ist allerdings die Frage ob auch alle Farben gut wiedergegeben werden, oder ob man eher nur schwarze Schrift gut sieht. Also dass das Prinzip eher für Schrift ausgelegt ist und nicht für Bewegtbild? Vielen Dank euch und beste Grüße! 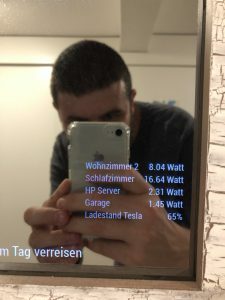 Hallo, ich habe das auf meinem SmartMirror nicht getestet, ich war aber schon in Hotel’s welche Tv’s im Bad hinter dem Spiegel hatten und somit eignetlich das gleiche Prinzip nutzen. Natürlich ist die Farbe nicht ganz so echt wie ohne Spiegel. Aber es funktioniert. Viel Spass beim basteln.